I Was Born For This!" 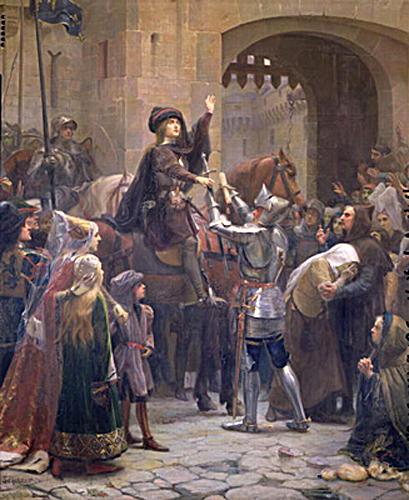 As Joan of Arc was leaving Vaucouleurs to begin her mission to save France she was asked by a women: "How can you make such a journey when on all sides are soldiers?" to which Joan responded: "I do not fear the soldiers, for my road is made open to me; and if the soldiers come, I have God, my Lord, who will know how to clear the route that leads to messire the Dauphin. It was for this that I was born!" The original in French is: "Je n'ai pas peur des soldats, car ma route m' a �t� ouverte, et si les soldats viennent, j'ai Dieu, mon Seigneur, qui saura comment lib�rer la route qui m�ne � Sieur le Dauphin. C'est pour cela que je fus nais." These words by Joan may now be her most famous quote however the version that is usually seen is "I am not afraid...I was born to do this." As you can see from reading the actual words that Joan spoke this version leaves out what to Joan would have been the most important part: God! Joan of Arc was a young women of great faith and she always looked to God for her strength. Joan 's banner contained a picture of God and the names of Jesus and Mary and her ring contained three crosses and the names of Jesus and Mary. Even Joan's letters that she sent out usually contained Jesus-Mary and a cross or crosses in the heading or by her signature. Joan would never approve of "I am not afraid...I was born to do this" being attributed to her as her quote. A translation that Joan would undoubtedly approve of is "I am not afraid, for God is with me. I was born for this!" 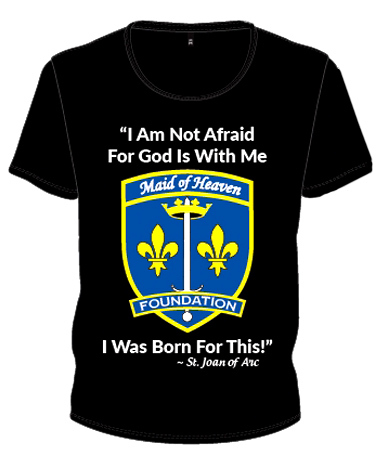 For anyone wanting to use this quote by Joan of Arc this is the version to use and it looks great on a t-shirt which you can now purchase at The Maid of Heaven Foundation by click on the t-sirt below.